Fit Models: 5.0 Digital & 5.0 Analog. Installation Is Easy: Simply unscrew the three screws from the back of your headset. Take note of how the old battery is seated before you remove it. Once the new battery is seated, screw the faceplate back into place. This is forONE headset (see pictures). Item has been tested and appears to be in very good working condition. In the newer 3.0 DIGITAL and 5.0 DIGITAL or ANALOG TV Ears headsets! This battery will. You should replace your battery every 2 years and keep one for a spare. It is quite simple to pop out old Battery assembly and pop in new one. For TV Ears 5.0 Digital & 5.0 Analog Headsets. Does NOT fit 3.0 Analog or Older TV Ears Headsets (See pictures above). THIS IS A DIFFERENT BATTERY THAN THE BATTERIES FOR THE OLDER 3.2 TV EARS SYSTEMS. 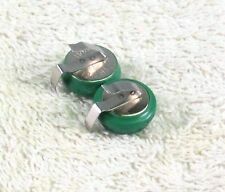 ONE battery set of two "cells" joined together. 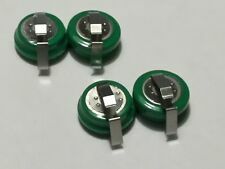 ONE battery set. 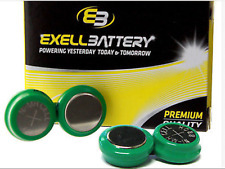 These Batteries are new, fresh from the manufacturer and are supplied assembled (welded) just like the originals. Does not include transmitter base, cords or any other accessories. Headset only. Does not include any other accessories. NEW IN OPENED BOX: TV EARS | 5.0 DUAL Digital Wireless Speaker System 2 HEADSETS & TRANSMITTER. (2) 5.0 Wireless Headsets. 5.0 Dual Digital Transmitter. Wireless 5.0 Speaker. Optical Digital Audio Cord. If your headset does not lookEXACTLY like the first headset example given in the pictures shown above these will not fit your headset. In addition, no representations of the manufacturer's warranty is made. Product Condition Details : Lightly Used Like New. LIGHTLY USED LIKE NEW. Used condition. TV ears digital base . One headset . Missing headset foam ear cushions. No charger . No accessory cables. Please view photos closely to judge the condition and feel free to ask any questions you may have. TV ears wireless sound amplifier. Item are tested and work. Includes, base,power cord and one set of headphones, no audio cable included. The foam on the headphones is falling apart. 2.3 MHz TV ears new in Box. I describe and photograph what I find. 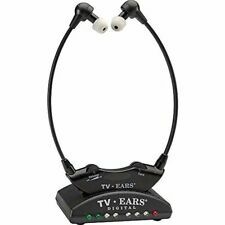 TV Ears Wireless Headphone Set Complete with Transmitter, Microphone, etc. Item number 11741. TV Ears transmits sound at the speed of light with infrared technology. TV Ears 5.0 Digital System. Digital Connectivity: Dolby, SRS, and PCM product compatibility.Includes an optical digital audio cord, an RCA audio cord, and a 3.5mm audio cord to connect the transmitter to your TV, satllite box, or cable box. TV Ears Headset With Transmitter Power Cord Needs Audio Plug 2.3 MHZ In Box. Condition is Used. Shipped with USPS Priority Mail. 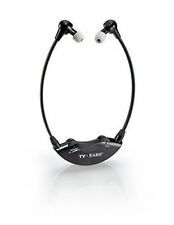 TV EARS WIRELESS HEAR TV BETTER 2.3 DOCTOR RECOMMENDED. Condition is New. Shipped with USPS Priority Mail. The TV Ears 2.3 System Has Helped Over 1 Million People Hear The Television Clearly And That Their Preferred Volume Without Disturbing Others In Their Home. 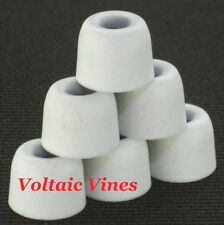 TV EARS HEADSET REPLACEMENT BOW ARM 2.3, 3.0 & 95. Condition VERY GOOD USED SMOKE FREE COSMETIC CONDITION! CLEANED & SANITIZED TESTED FUNCTIONS PERFECTLY! 30 DAY HASSLE FREE RETURN POLICY! FREE SHIPPING WITH TRACKING! PAYMENT DUE IN 2 DAYS! Reprint from TV Ears operation Manual “Always use two hands to place and remove your headset from your ears. The new bow can be reattached using a little airplane glue on the arm, front case and the remaining single clip hook.Reassemble the two halves of the blue receiver headset, let the glue dry and then enjoy your repaired headset. Include TV EARS : Cradle # 103414. This item is preowned. We try to disclose all issues, but everyone has different standards. -Good condition. 1-AC ADAPTER & AUDIO CABLE. EXTRA INFORMATION. Our goal is to keep you satisfied and resolve any issues you may have. NEW in Package! Please contact me with any questions before bidding. All sales are final. Tv Ears Digital 2012 Headset and charging base. 21502 Voice Clarifying. Item has been fully tested works and sounds great. Cosmetically the item is in great condition a few light scratches from normal use but all very minor. 4 best condition and description of item please see all pictures prior to purchasing. Item will be shipped USPS Priority Mail free of charge. • TV Ears "Plus". You will receive 1 dual-cell battery (enough for 1 headset) just as pictured in picture 1. Battery only. This does NOT include plastic faceplate. • Older 95 kHz "Original" (Not newer 3.0 "Original"). TV Ears Base Station 10310. This item is used, in very good condition. RCA audio cable. Power Adapter. Item has been tested, and no faults have been observed during its functioning. Item may have very slight scuffing or scratches, consistent with normal usage; see photos for details. Excellent pre-owned condition, tested, and is in good working order.